On this holy night, Holy Mother Church instructs all priests to preach on three things: 1) the Eucharist, 2) the priesthood, and 3) and the mandate to love. The Church has good reason for this instruction; it was on the first Holy Thursday, during that first holy week, when Jesus celebrated the First Holy Mass, ordained his first priests, and commissioned them to go about the mission of love, the mission of service. First, the Eucharist. There are a lot of images for the Eucharist. Wheat, a basket of loaves, fish, grapes, etc. My favorite is the pelican. It is said that when a mother pelican’s baby chicks have nothing left to eat, she plucks her own flesh and gives it to her children. She feeds them with herself. Like the Lord Jesus, she loves her own—and she loves them to the end. She would rather die that they might live, than watch her children die. This is the Eucharist. It is about love. The Eucharist is Jesus loving us until the end—that we might have life, and not just life on earth….but life in heaven. If people understood the Eucharist they would never walk away from the church. Never. If people truly understood the Eucharist, we would never have an open holy hour or an unfilled Mass. The Eucharist is Jesus Christ. Tonight we thank him for giving us himself. Second, the Priesthood. Because of Jesus’ love and his desire from that love to pass on the Eucharist and the other sacraments, he instituted the priesthood. A man I know in Bloomington prays a rosary every day for “greater devotion to the priesthood.” That is wise. He is praying not for greater devotion to this priest or that priest, but to the priesthood. When I think about the priesthood, I think about the priests I know and how they have brought me closer to Jesus. I think of Fr. Ron Ashmore who baptized me. I think of Fr. Charlie Chesebrough who heard my first confession and gave me my first communion, and who always called me “big Mike” and made me feel special. His presence was larger than life. He was the first one to tell me: You should go to the seminary. I think of Fr. Don Davison who we lovingly called the Prince of Darkness. You’d have to know him to understand that title. His mind is a labyrinth and his every homily took me deeper into the beauty of my Christ and his beautiful church. I think about Fr. Joe Moriarty, my spiritual director, and the holiest man I know. His heart is as close to the Sacred Heart as one could ever find on this side of heaven. I think about Fr. Mike Fritsch who taught me the importance of good liturgy, Msgr. Stumpf who guided me into the seminary and still, even as vicar general, hasn’t forgotten about me. I think about Msgr. Svarczkopf, my first pastor as a priest who made me love being a priest. 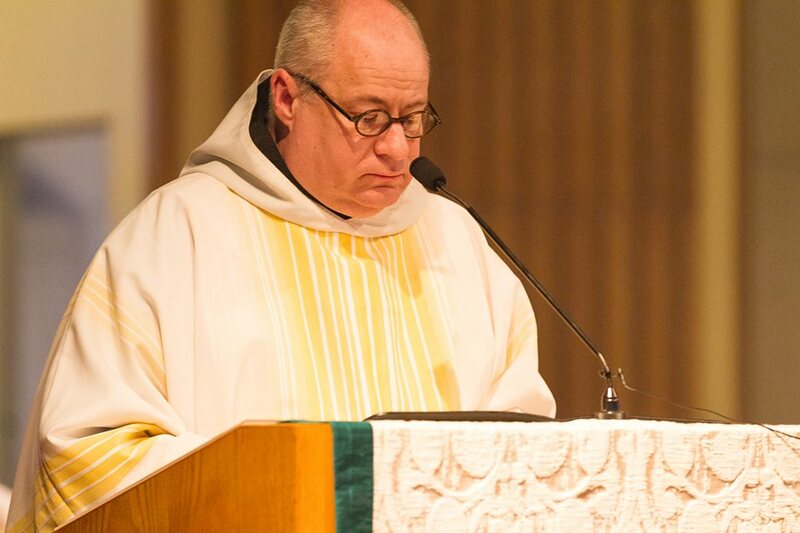 I think about my friends who have made me a better priest: Fr. Rodriguez, Fr. Aaron Foshee, Fr. Aaron Pfaff, Fr. Michael Cronin, Fr. Adam Ahern, Fr. Meyer, Fr. Luke Waugh. The list could go on. These men are Christ to me—they’ve heard my confessions, anointed me, blessed me, laid hands upon me, led me, nourished me, strengthened me, given me counsel, confected the Eucharist for me countless times. They have me Christ. I love them all in their weakness and in their brokenness. Less than a week ago I found a letter in a file cabinet. I was doing some spring cleaning in the middle of the night. This letter was three pages about how evil and awful this person believed my processors here to have been. It broke my spirit to read it. It made me angry and then it made me sad. I burned it. None of those priests were perfect; nor am I. Some of them were great preachers and some terrible preachers, some struggled with demons we will never know. Some were friendly and some weren’t, some were liberal and some were conservative. Some of them think like I do and some don’t. Some made decisions I like and some did not. But all of them are forever priests of Jesus Christ who bring souls to heaven and heaven to souls. All of them gave up their lives for Jesus and his church. How dare we speak ill of any of them. I thank God for each and every one of them. And I thank God that I am a priest, that God has allowed me to stand under the floursent lights of hospital rooms and guide souls to the kingdom and comfort those who watch their loved ones fade away, that he has allowed me to stand at his altar and bring to the world his body and blood every day, that he allows me the grace to sit in the confessional in order to listen to life’s disappointments and failures and absolve sins and loosen their chains. I thank God that he has allowed me the grace to stand at the door of the church and in his place open my arms wide to receive a soul for baptism and pour the waters of salvation onto beautiful baby’s heads. I thank God that he allows me the grace to teach religion class and play basketball, help the poor, instruct RCIA and lead a youth group and visit the elderly, all in one day’s time. I love it. Third, the mandate to love. No greater love is there than this. Our Protestant friends call today Maundy Thursday because that word “maundy” comes from the same Latin word as mandate – mandatum. Jesus gives us an incredible example of service in washing the feet of his apostles. We are to serve beyond what we are comfortable with. We are, like Christ, called to love others until the end—without condition, without reservation, just as he did. The Eucharist, the Priesthood, and the Mandate to Serve. Those are the three reasons we are never alone. We are never alone because we always have the eucharist, we always have our priest, we always have the call to serve. Friends, Mass ends in a different way tonight. Mass ends with a procession to this side altar, what’s called the altar of repose. Jesus will be in the tabernacle until 11pm, about the hour that he was arrested. Catholic churches around the world have altars of repose tonight because after trhe Last Supper, Jesus invited his disciples to the garden of Gethsemane to pray with him before his passion. All are invited to the altar of repose after Mass. Please pray there for your priests. Pray for me. Thank God for the Eucharist, help him to convict you more of his Real Presence. And pray that God will help you to understand where he is calling you to serve and give you the courage and heart to do it. As always, audio is here. To God and to the OLG flock: Thank you for letting me be your priest! to bless and be blessed forever. O God, what a life! And it is yours, O Priest of Jesus Christ! This past Saturday, my good friend, Fr. 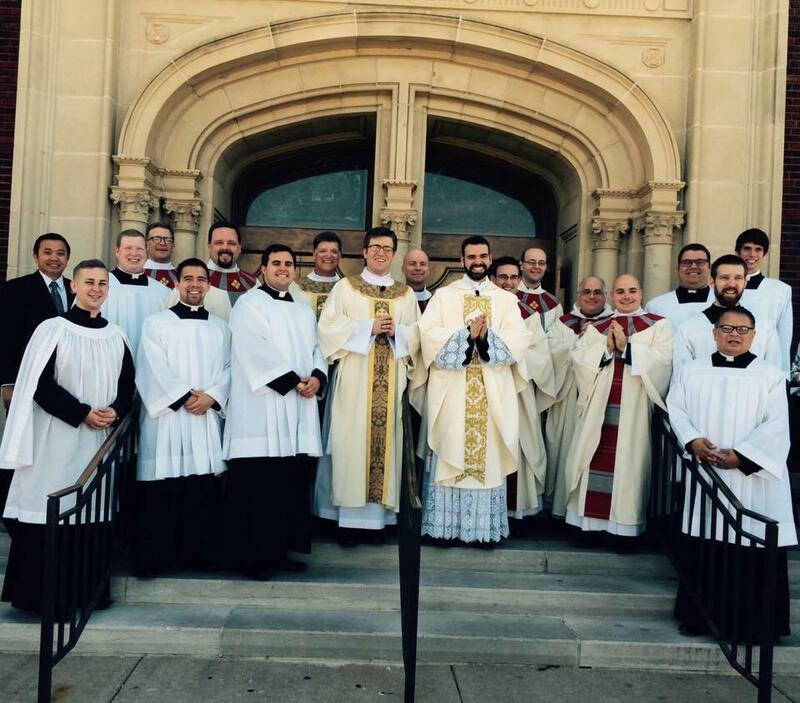 Aaron Foshee, was ordained a priest for the Archdiocese of Oklahoma City. Below is the homily preached by Fr. James Goins (without text or notes!) at his Mass of Thanksgiving. We celebrate this morning the gift of a new priest. A new priest has come down to the vineyard of the Lord, a new voice, and what a voice it is. We gather here with Fr. Foshee and his family. We, his brother priests who are here with him, will gather around the altar this day and pledge to him our priestly friendship, our prayers and support for him in the years to come. I want to look at the miracle within the miracle in the Gospel passage. I want us to contemplate this unfortunate suffering woman who risked all to thread her way through the crowd, to find a way to the hem of Christ’s garment. It is this miracle within the miracle that caught my attention and imagination as I prepared to preach this Mass. Below is the text of the homily given at my Mass of Thanksgiving by Fr. Denis Robinson, OSB, on June 6, 2015, the Solemnity of Corpus et Sanguis Christi. I would like to begin by saying that, in general, I am not a nostalgic person, though you may think differently in the next few minutes. As I get older, I begin to put together bits and pieces of the past in the hopes that I might find different and better paths for the future. Today I am thinking about 1993. 22 years ago today I had the great blessing of presiding at Mass for the first time, on the Solemnity of the Body and Blood of Christ. I was thirty years old, brand newly ordained and ready to take on the world. I also resolutely admit that I was pretty green. I think I am still a little green around the edges. Pope John Paul II, in his last Holy Thursday homily, wrote this. Every time we celebrate the Eucharist, the remembrance of Christ in his Paschal Mystery leads to the desire for a full and definitive encounter with Him. We live in expectation of his coming! In priestly spirituality, this expectation must be lived out through pastoral charity, which impels us to live in the midst of God’s People, so as to direct their path and to nourish their hope. This task requires from the priest an interior attitude similar to that of the Apostle Paul: “Forgetting what lies behind and straining forward to what lies ahead, I press on towards the goal” (Phil 3:13-14). The priest is someone who, despite the passing of years, continues to radiate youthfulness, spreading it almost “contagiously” among those he meets along the way. His secret lies in his “passion” for Christ. As Saint Paul said: “For me, to live is Christ” (Phil 1:21). Particularly in the context of the new evangelization, the people have a right to turn to priests in the hope of “seeing” Christ in them (cf. Jn 12:21). The young feel the need for this especially; Christ continues to call them, to make them his friends and to challenge some to give themselves completely for the sake of the Kingdom. Vocations will certainly not be lacking if our manner of life is truly priestly, if we become more holy, more joyful, more impassioned in the exercise of our ministry. A priest “won” by Christ (cf. Phil 3:12) more easily “wins” others, so that they too decide to set out on the same adventure. “We must take the power of prayer on faith. We shall never know till the last day all the answers there have been to our prayers, nor how they have told upon the Church for hundreds and hundreds of years. “So, perhaps, somebody asks the prayers of the Confraternity [so that] obstacles to his vocation to the religious life or the ecclesiastical state may be removed, and it is granted some Friday evening to our prayers. He becomes a priest: he saves hundreds of souls; these souls save others, some by becoming priests themselves, some by becoming nuns, some by becoming holy fathers and mothers in the world; and so the prayer goes on spreading and spreading, and may very likely be found actually at work in the dead of that night when all the earth will be awakened to see our Lord coming in the east.